All the recent hoopla around Mariano Rivera's retirement brings to mind other, crappier ways that famous athletes have elected to leave the game(s) they love. Like Mickey Mantle, for instance. Along with Willie Mays — shown eating breakfast in last week's Picture This — Mantle was one of the true glamor ballplayers of the 1950s: prodigiously talented, scarily fast and capable of hitting tape-measure home runs from either side of the plate, he was the most exciting member of the Yankee teams that won seven World Series during his career. But serious injuries and oceans of booze took their inevitable, sordid toll, and the man began to fall. He played his last game almost exactly 45 years ago, on Sept. 28, 1968, but by then Mantle had been an average player for several years. The picture above — made by LIFE's John Dominis in 1965 — captures him near the beginning of the long, torturous end; it is the best photograph ever made of a great athlete in decline. 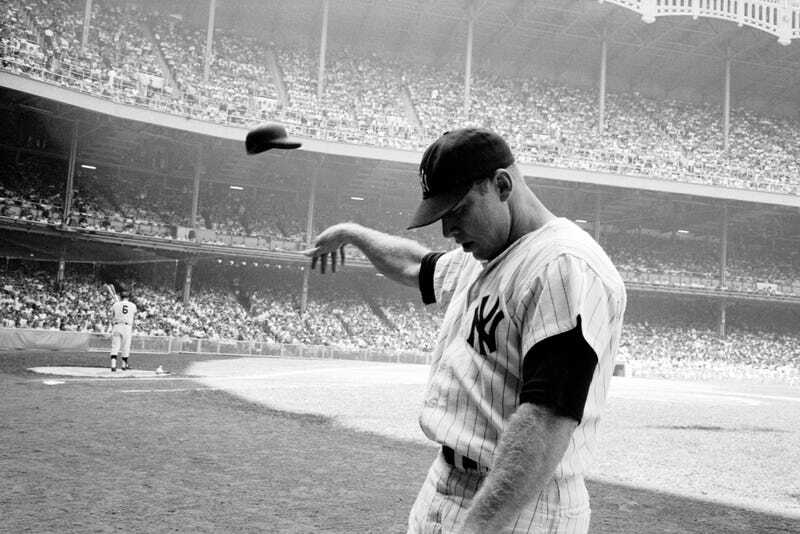 And yet … in Dominis’ riveting photo, there remains something defiant, something unbroken, in Mantle’s gesture — even as we know, and even as the fans then knew, that his days as a force on the diamond were gone forever. The almost balletic posture of the hand that tosses the helmet; the latent strength so evident in Mantle’s muscled forearm and, indeed, in his entire frame — these details remind us that even in the twilight of a career, the most memorable athlete retains something of the magnetism that made us stand and cheer in the first place.